I don't know about you, but in the past couple years, I've seen our average grocery bill increase by about 50%. Yes, my kids are bigger now, and the adolescent boy complains every night about how he's starving all the time, and his sisters have learned not to leave food they plan on eating unattended, but that can't account for the entire upswing. So I was glad to see some recent articles that told me the rising costs weren't all my fault. 1. Bacon. Possible explanation? The delightfully-named Porcine Epidemic Diarrhea Virus (PEDv) in hogs. 2. Ground Beef. Culprit? Drought. 3. Oranges. Blame: Citrus greening disease in Florida and drought in California. 4. Coffee. Guilty party? Drought and producer stockpiling. 5. Peanut Butter. Pointing finger? "Poor growing conditions" and possibly increased Chinese demand, for Pete's sake! 6. Margarine. The Reason Why: who cares! You seriously should not be eating this fake food anymore anyhow. Betty Botter bought a bit of better butter. And it was called just plain Butter. 7. Wine. Whodunnit? Drought in California and general demand increases. 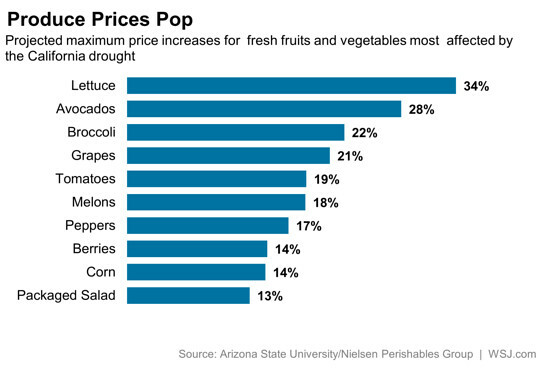 Apparently we're drinking more to comfort ourselves for rising food prices. 8. Turkey. For want of a nail...drought led to rising corn and soy prices, which led to more expensive feed. 9. Chicken. See Turkey. That, and the whole world is eating more and more chicken because agro-industrial practices have made it comparatively cheap. What does this mean for our farmers market? I expect we'll see higher prices. After all, a rising tide lifts all the boats. I know that Skagit River Ranch cut way back on their chickens because of the feed costs, especially since they can't make up the dollars lost by cramming chickens in crates on top of each other. It'll be interesting to talk to the farmers and ask how Washington's precipitation is doing, from their perspective, and what rising costs of their own they see. I do have a couple money-saving reminders for you, though, so all is not lost. Remember, if you can find your vegetable or fruit on the "Clean 15" list, there's no need to buy organic. Thanks, Mary Crimmins, for the cute graphic! I've taken to stretching a pound of meat with a can or two of black beans, and remember that saturated FAT promotes satiety faster (and slows spikes in blood sugar). Add more butter. More cheese. More whole milk and cream. Slather those bagels and pieces of toast and what-have-you in cream cheese! As I mentioned last week, to everyone's relief and good health, fat is back on the menu. So raise your milkshake to an end to the drought, and here's hoping prices come down soon. Older PostBring on the Butter, Meat, and Cheese!